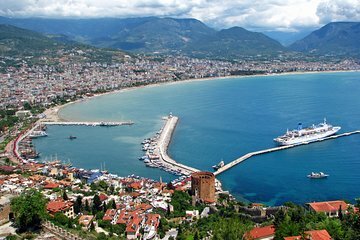 Soak up the highlights of Alanya, one of the liveliest resorts of the Turkish Riviera, on this full-day tour from Side, including hotel pick-up and lunch. Start with a comprehensive sightseeing tour of the city, visiting Alanya Castle, Cleopatra beach, Damlatas Cave and the Red Tower, then head to Alanya Harbor for a 1-hour cruise around the bay and finish with lunch on the banks of the Dimcay River. Banana plantation. 10min stop on dirt track. Pointless. Boat trip, really good fun 1hr. Castle, you get as far as the free to access view point, not in the castle it's self. Cop out! Cave, 2€ extra, worth it. Should be included! River and meal really good, longer stay here required.